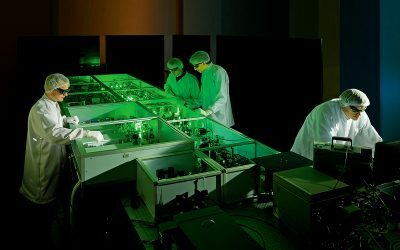 Ultra-high intensity laser applications span a number of scientific disciplines, such as plasma physics and fusion research, atomic molecular & optical physics, femtosecond chemistry, astrophysics, high energy physics, materials science, biology, and medicine. 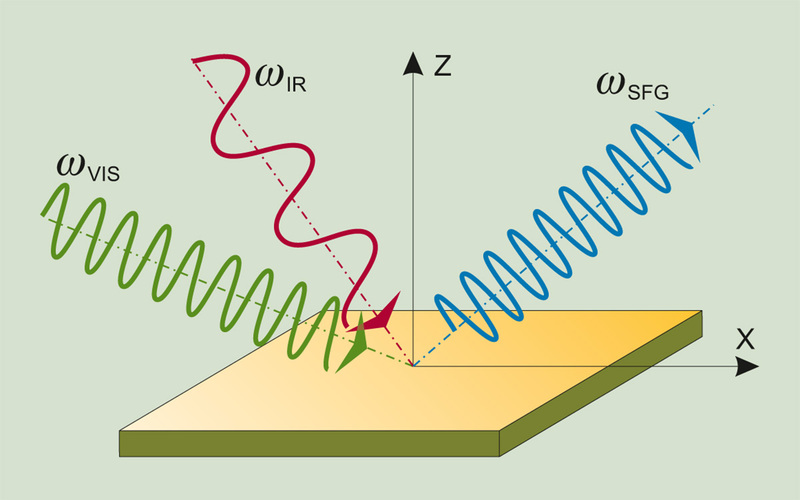 In nonlinear optics, z-scan technique is used to measure the non-linear index n2 (Kerr nonlinearity) and the non-linear absorption coefficient Δα via the “closed” and “open” methods to measure both real and imaginary components of the nonlinear refractive index. For measuring the real part of the nonlinear refractive index, the z-scan setup is used in its closed-aperture form. The sample is typically placed in the focal plane of the lens, and then moved along the z axis, defined by the Rayleigh length. In this form, since the nonlinear material reacts like a weak z-dependent lens, the far-field aperture makes it possible to detect small beam distortions in the original beam. Since the focusing power of this weak nonlinear lens depends on the nonlinear refractive index, it is possible to extract its value by analyzing the z-dependent data acquired by the detector and by interpreting them using an appropriate theory. For measurements of the imaginary part of the nonlinear refractive index, or the nonlinear absorption coefficient, the z-scan setup is used in its open-aperture form. 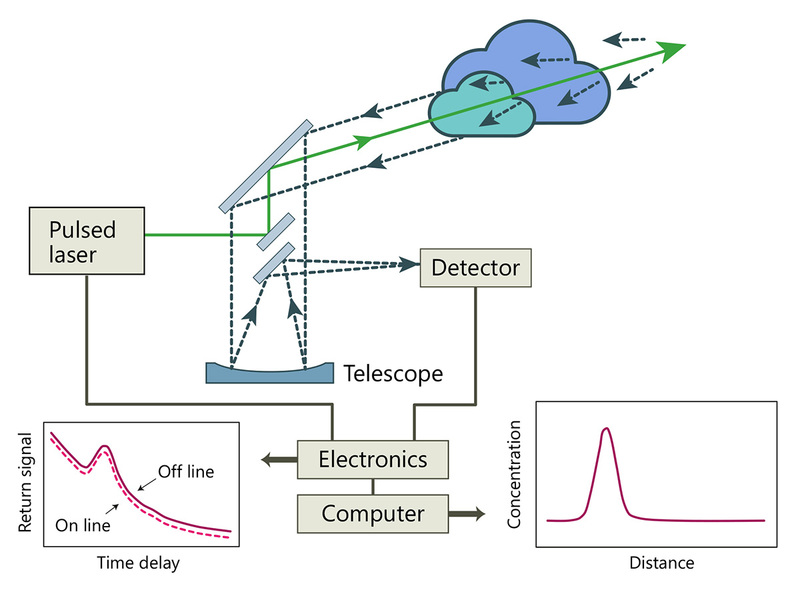 In open-aperture measurements, the far-field aperture is removed and the whole signal is measured by the detector. By measuring the whole signal, the beam small distortions become insignificant and the z-dependent signal variation is due to the nonlinear absorption entirely. The main cause of non-linear absorption is two-photon absorption. Due to high pulse intensity and cost effectiveness, picosecond high energy lasers are the most appropriate choice for z-scan measurements. LIDAR is an acronym for “LIght Detection And Ranging”. LIDAR sends out short laser pulses into the atmosphere, where all along its path, the light is scattered by small particles, aerosols, and molecules of the air and is collected by telescope for analysis. Due to the constant velocity of light, time is related to the scatter’s distance, therefore, the spatial information is retrieved along the beam path. LIDAR uses ultraviolet, visible, or near infrared light to image objects. It can target a wide range of materials, including non-metallic objects, rocks, rain, chemical compounds, aerosols, pollutants, clouds, and even single molecules. LIDAR especially helps in those cases where access with conventional methods is troublesome. Laser-induced breakdown spectroscopy (LIBS) utilizes a high intensity short laser pulse to convert a very small amount of target material to plasma for optical analysis of the spectra. 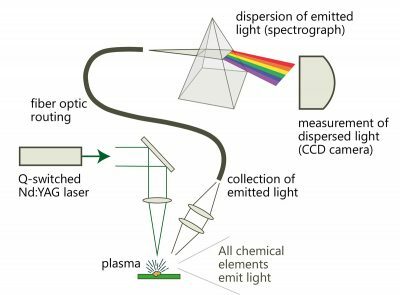 LIBS can be used on solid, liquid, or gas samples, and, depending on the spectrograph and detector, can detect all elements. LIBS is non-contact, so it can be used in a wide variety of environments, including remote analysis and micro-sampling. When coupled with appropriate optics and stages, elemental maps of a surface can be created. Multiple LIBS scans can effectively resolve material composition throughout the volume, building a full three dimensional elemental map. 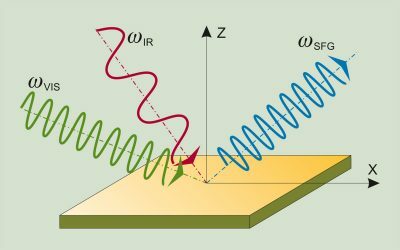 Sum frequency generation vibrational spectroscopy (SFG-VS) is used to characterize vibrational bonds of molecules at surfaces or interfaces. SFG spectroscopy is particularly attractive because of molecular specificity and intrinsic interfacial sensitivity. Surface sensitivity of the technique arises from the fact that within the electric dipole approximation the nonlinear generation of the sum-frequency (SF) signal from the overlapped visible and infrared beams is forbidden in the media of randomly oriented molecules or in the centrosymmetric media but is allowed at the interface where inversion symmetry is broken. Molecular specificity emerges from the ability to record vibrational spectrum. In SFG-VS measurements, a pulsed tunable infrared IR (ωIR) laser beam is mixed with a visible VIS (ωVIS) beam to produce an output at the sum frequency (ωSFG = ωIR + ωVIS). SFG signal is generated in visible spectral range, so it can be efficiently measured using sensitive detectors (PMT or CCD). Second harmonic generation (SHG) is a second order nonlinear optical effect where two photons of frequency ω are converted to one photon of frequency 2ω. SHG is allowed only in media without inversion symmetry. SHG is a sensitive method used to characterize molecules at surfaces or interfaces because inversion symmetry is broken at the interface. SHG measurements provide information about: surface coverage, molecular orientation, adsorbtion-desorbtion processes, and reactions at interfaces.